How Corporates can make an Impact! IIMPACT receives 90% of our funding support from corporate sponsors. We can meet with corporates and charitable foundations to present tailored proposals that align with your values and goals for social change. VISION: Create Enabling Conditions for Girls’ Education. MISSION: Involve every ‘out of school’ girl in the 6-14 age group in meaningful education through specially modeled IIMPACT Learning Centres that cater exclusively to the girl child. To identify ‘out of school’ girls between ages 6-14 years through micro-surveys in 2-3 districts in each state with female literacy below 25%. To involve all the identified girls in alternative Learning Centers opened at strategic locations to enable access to schooling with 30 girls per LC. To educate the girls in Learning Centers so that they complete their education till class V in the shortest time. To sensitize parents and community towards the girl child education through participation in village education committees/parent committees. To work towards increased formal school enrolments for girls. IIMPACT’s work spans one and a half decades, 11 states and thousands of girls each year. Partner with us, thus giving us the opportunity to reach out to many more. The IIMPACT model ensures that there is flexibility in terms of norms of enrolment, pace of teaching, teaching methodology, school time-table etc. that suits every out of school girl and no eligible girl is left out of the program in the project area/village. The IIMPACT focus is that the education has requisite quality and is child-centred and gender-sensitive. It is based on a curriculum that is relevant to the needs and reality of learners, and relies on trained teachers equipped with appropriate learning materials. School is held in a child-friendly environment – one that is safe, clean and conducive to learning and play. Schools are expected to not just impart education in its narrow sense but, more broadly, to mould children’s attitudes. All effort are made that egalitarian values, compassion, and tolerance, concern towards others, respect for cultural diversity, gender sensitivity and health education are integrated in the curriculum. At IIMPACT your organisation can support the primary education for girls studying in class 1 – 5. We’re transparent: Our financials are public, and have been for over 15 years. As an organisation, we are mandated to carry out an annual external financial audit. We manage and monitor our projects: We manage and monitor our projects stringently to ensure efficient utilisation of funds. Projects are also regularly assessed by professionals to measure progress against plans. Meetings with project staff, parents, children and community groups help us gauge progress. We stand for Sustainable Change:We focus on education which goes hand in hand with the mobilisation and empowerment of communities. Our approach brings about change that can sustain itself. Corporate Social Responsibility with IIMPACT- We invite the business community to champion our cause going forward. Help us learn and implement better, innovate and deepen our impact, share your time and ideas to give young girls opportunities they deserve. Choose to support an existing program or take our interventions to a new location -giving back in partnership with IIMPACT will undoubtedly lead to greater impact on the ground and help us impact on scale. It costs INR 1,05,000 to educate 30 girls for one year. We have so far reached out to over 73,000 previously out of school girls. 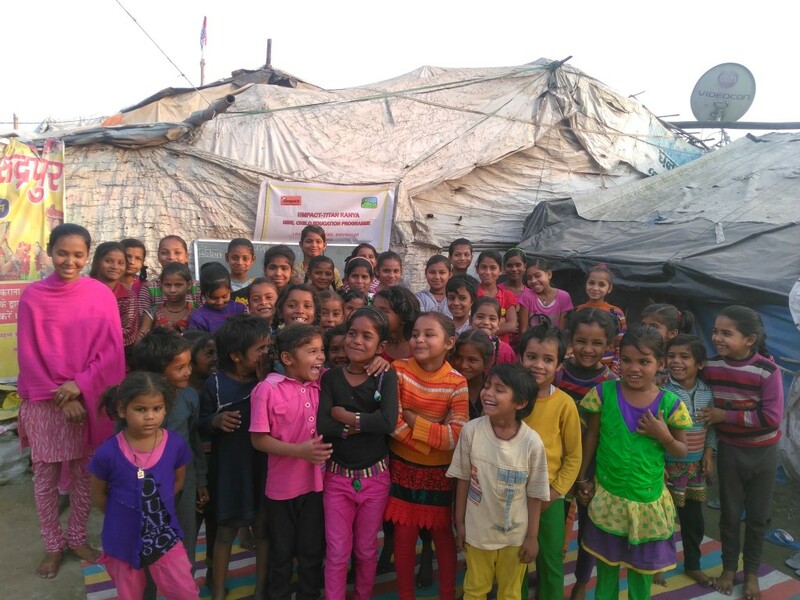 With our corporate social responsibility initiatives many more girls in India can receive your support. You can also contribute towards the setting up of Libraries, Solar lights and fans , IT enabled learning in the classroom. ANNUAL COST OF ONE IIMPACT LEARNING CENTER: INR 1,05,000 or USD 1600. IIMPACT will work with Foundations and Corporate Sponsors to set up a phased implementation program and agree measurable indicators of success and milestone outcomes, with ongoing reporting on performance to a Program Steering Committee. IIMPACT offers a program for change based on a model that has been proven in the field, is scalable and constrained only by funding. A partnership with Corporate Sponsors will achieve social and economic outcomes in alignment with the goals of the sponsors. The opportunity to present a detailed project proposal will be greatly appreciated. Please contact IIMPACT President, Mr Arvind Mahajan to discuss how we can work with you. See: Contacts.